Improve Your Style: Take Flamenco Lessons In Seville! Unsurprisingly flamenco lessons have become very popular in Seville. They’re a perfect way to connect with the dancing culture of a city famous for being the origin of flamenco. An afternoon spent at a flamenco class will be a memorable experience that will enhance your visit to the cradle of flamenco. Without a doubt it will inspire you to show off to impress your friends when you’re back at home. If half a day is not enough, you can choose a whole day or even longer periods – the possibilities are endless depending on your availability and how long you are in Seville. These flamenco lessons have been selected after months researching and contacting dozens of schools here in Seville. The classes include many options – from private lessons to group classes at the school. But don’t be afraid to suggest other interests you may have, or ask any question before taking the leap. In this course you will pick up the essential foot/heel rhythms, posture, strength and body control, as well as hand movements and expression. Somewhere, deep inside, there’s a flamenco dancer in us all. Have fun finding yours. The Beginner Classic Dance Course is suitable for all, whether you have danced before or are a complete novice. The teacher will support you and adapt the lesson to your needs. At the end of the flamenco lessons you will know about posture and position in dance, understand rhythms and body control, lose inhibitions and gain confidence. The introductory class to flamenco technique is all about coordination. You will learn the basic movements of different parts of the body and consolidate fundamental concepts to practice flamenco dancing. One of the most important aspects is working on expression and dynamics, and co-ordination of hands and feet. Your teacher will guide you step by step to practice a routine while improving your performance and technique. You’ll receive friendly feedback throughout so that you don’t miss anything. This course is suitable for those who have taken some beginners’ flamenco lessons or those who have had flamenco experience previously. Either way, the teacher will support you and tailor the class to your needs. 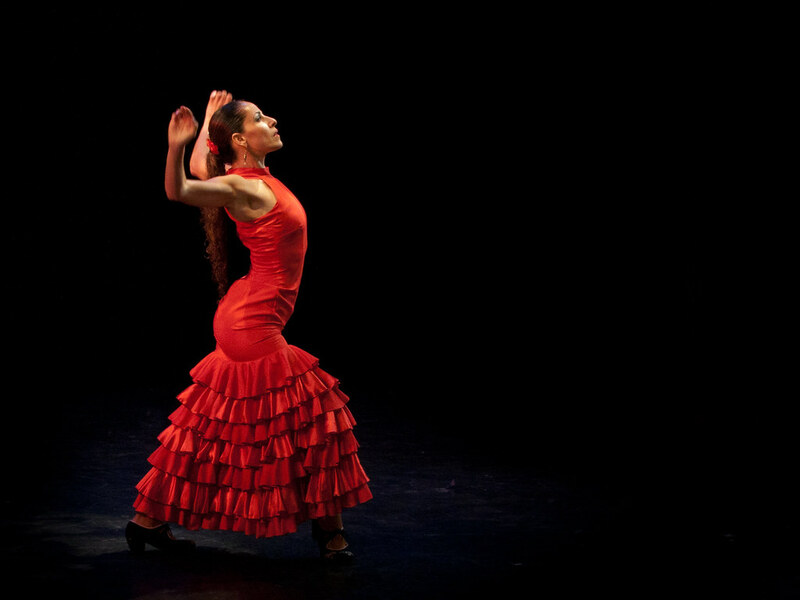 The lessons will help you gain a greater understanding in the essential rhythms and body control involved in flamenco. Additionally you will acquire confidence in choreography and individual movement within routines. Rehearsing a routine and working on light and shade footwork will lead you to learn intricate and difficult steps, turns and rhythms. Todo Compás combines flamenco dancing, technique and guitar with a special emphasis on compás (rythm). Dancing to the sound hand clapping is one of the most beautiful parts of flamenco. Feeling the rythm and performing it with your hands will show you how much passion flamenco involves. The compás lessons are generally given in groups. Each basic family of styles (palos) such as soleá, bulerías, tientos or seguiriyas will be covered. You will accompany the rythms of guitar properly and dance accordingly. In addition to its regular courses, the school also organizes other specifically designed courses at different times of the year. For instance, Estaciones Flamencas is combination of courses including a large program of activities related to the flamenco way of life. Or you can go for a Flamenco Weekend. Stop being part of the audience, cross the line and get into this magic world. Check your skills taking intensive flamenco lessons, enjoy a live performance, and indulge yourself with Seville’s flavors during an unforgettable weekend. You can even have an extra lesson on Friday afternoon, it’s up to you!